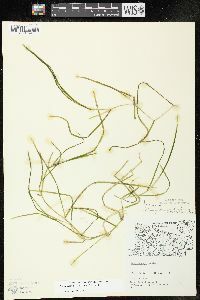 Rhizomes absent. 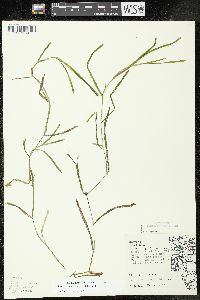 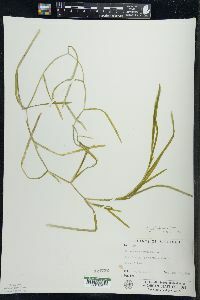 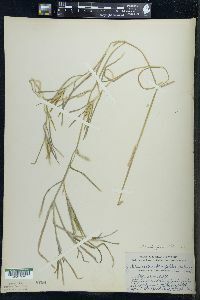 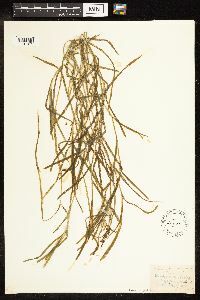 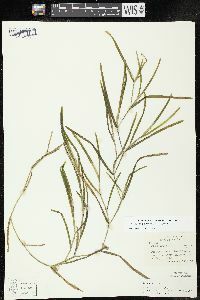 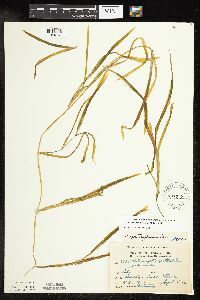 Cauline stems conspicuously flattened ('wing-flattened'), without spots, 60--120 cm; glands absent or rarely present, when present, gold, 0.3 mm diam. 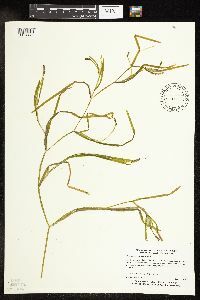 Turions common, terminal or lateral, 4--7.5 ´ 2--4.5 cm, firm; leaves ± 2-ranked; outer leaves 3--4 per side, base not corrugate, apex acute; inner leaves undifferentiated. 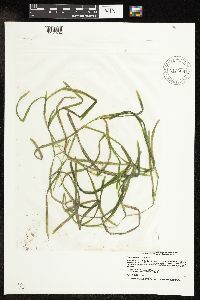 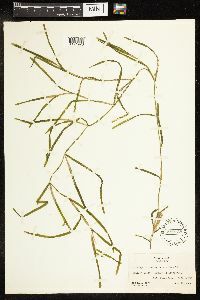 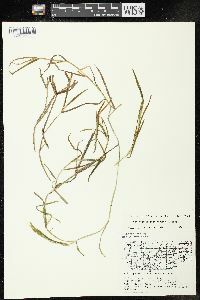 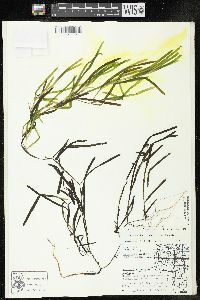 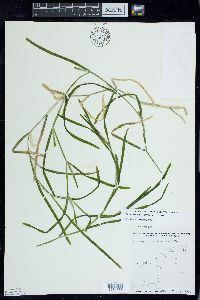 Leaves submersed, ± spirally arranged, sessile, rigid; stipules persistent, conspicuous, convolute, free from blade, white, not ligulate, 1.5--3.5 cm, fibrous, shredding at tip, apex obtuse to acuminate; blade light green, linear, not arcuate, 10--20 cm ´ 2--5 mm, base rounded, without basal lobes, not clasping, margins entire, not crispate, apex not hoodlike, blunt, acuminate, or bristle-tipped, lacunae absent; veins 15--35. 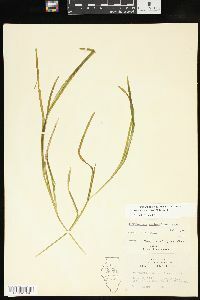 Inflorescences unbranched, emersed; peduncles not dimorphic, terminal, erect to ascending, occasionally recurved, cylindric, 2--5 cm; spikes not dimorphic, cylindric, 15--30 mm. 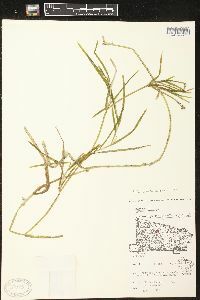 Fruits light green to olive-green, quadrate-oblong or nearly orbicular, turgid, sessile, with abaxially keeled, not laterally keeled, 4--5 ´ 3--3.5 mm, keel winglike; beak erect, 0.6--1 mm; sides without basal tubercles; embryo with 1 full spiral. 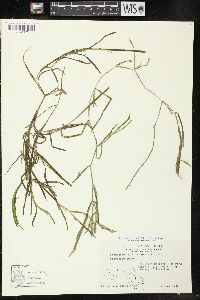 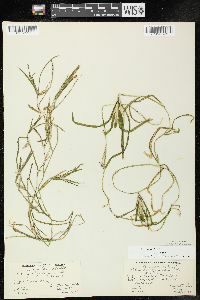 2n = 52. 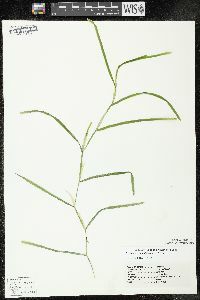 Flowering summer--fall. 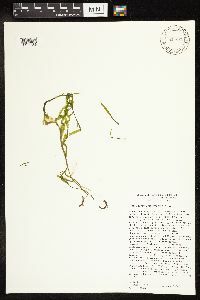 Lakes, ponds, and slow streams; 0--15003000 m; Alta., B.C., Man., N.B., Nfld. 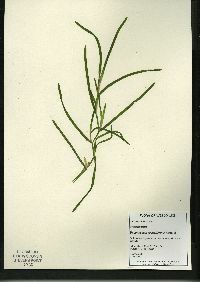 and Labr. 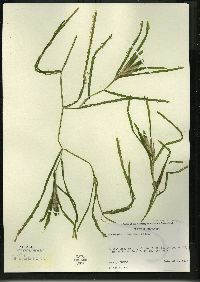 (Nfld. 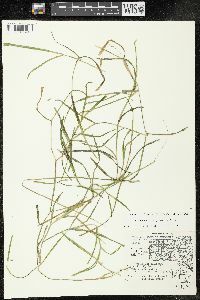 ), N.W.T., N.S., Ont., P.E.I., Que., Sask., Yukon; Alaska, Calif., Conn., Idaho, Ill., Ind., Iowa, Kans., Maine, Mass., Mich., Minn., Mont., Nebr., Nev., N.H., N.J., N.Y., N.Dak., Ohio, Oreg., Pa., S.Dak., Utah, Vt., Wash., Wis., Wyo. 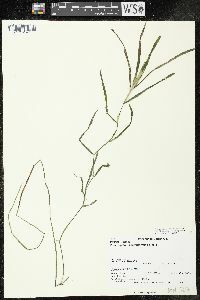 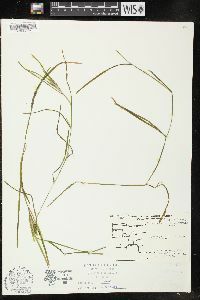 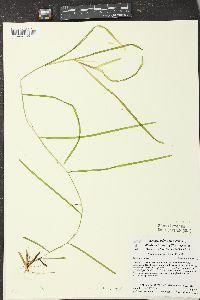 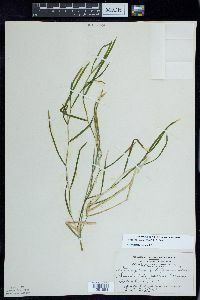 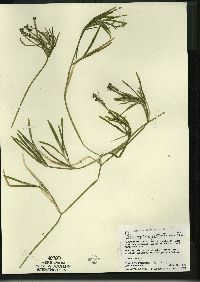 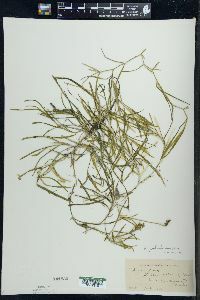 One hybrid, Potamogeton zosteriformis ´ P. strictifolius, has been described and has been given the name P. ×haynesii Hellquist & G. E. Crow and is known from northern Michigan, Minnesota, Vermont, and southern Canada. 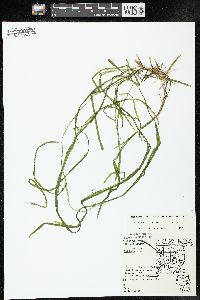 Perennial submersed aquatic herb 0.6 - 1.2 m tall Stem: freely branched, elongate, strongly flattened, jointed, usually without nodal glands. 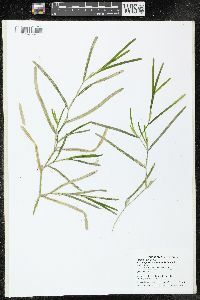 Leaves: submersed, more or less arranged spirally, stalkless, translucent, 10 - 20 cm long, 2 - 5 mm wide, linear with a rounded base and blunt to pointed tip (sometimes bristle-tipped), 15- to 35-veined, and firm. 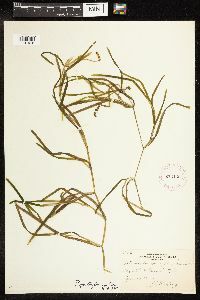 Stipules axillary, free from leaf blade, whitish, rolled up, 1.5 - 3.5 cm long, fibrous, shredding at tip. 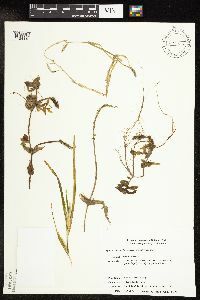 Inflorescence: a cylindrical spike with seven to eleven whorls of flowers, emersed, unbranched, 1.5 - 3 cm long, on a terminal stalk. 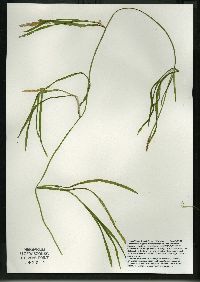 Stalk often curved, cylindrical, 2 - 5 cm long, and firm. 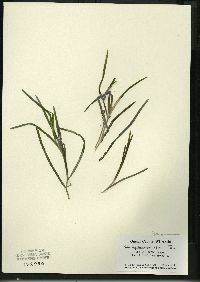 Flowers: greenish, tiny. 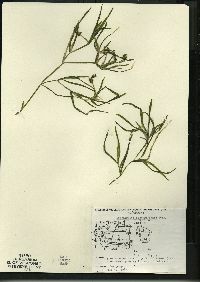 Stamens four. 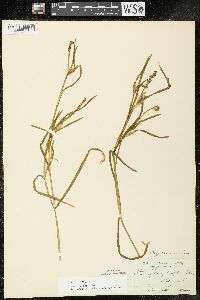 Anthers two-chambered, with four edge-to-edge sepal-like outgrowths. 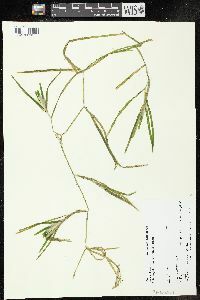 Fruit: an achene, stalkless, light green to olive, 4 - 5 mm long, 3 - 3.5 mm wide, broadly elliptic to egg-shaped, plump, keeled, with an upright, 0.6 - 1 mm long beak. 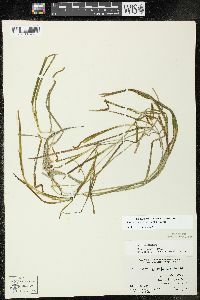 Keel wing-like. 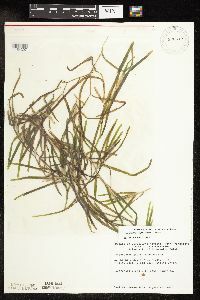 Habitat and ecology: Frequent in streams and lakes. 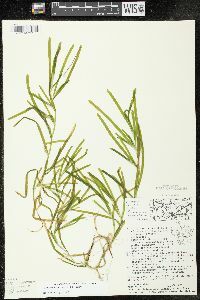 Etymology: Potamogeton comes from the Greek words potamos, meaning river, and geiton, meaning neighbor, referring to the habitat of these plants. 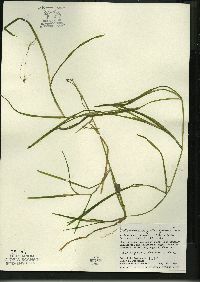 Zosteriformis means "similar to (the genus) Zostera." 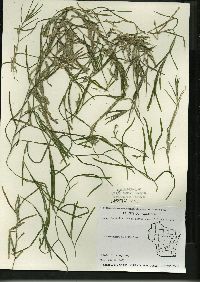 Frequent in the lakes of the lake area from which there are many reports. 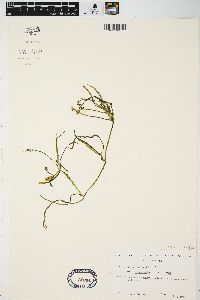 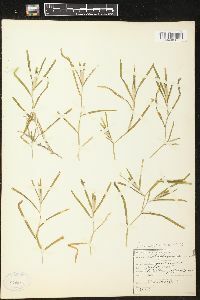 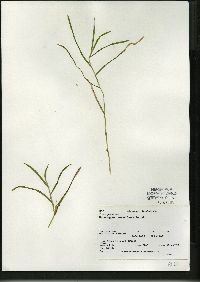 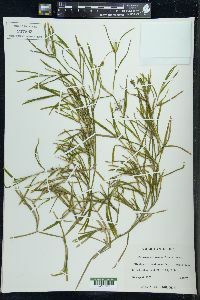 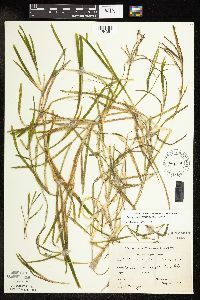 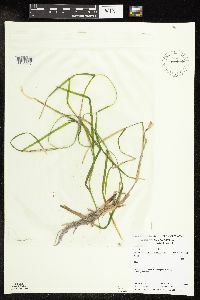 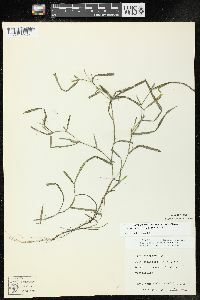 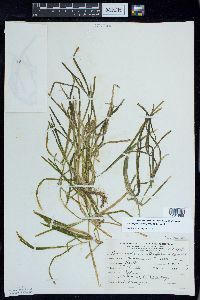 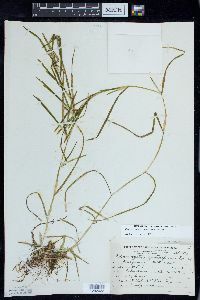 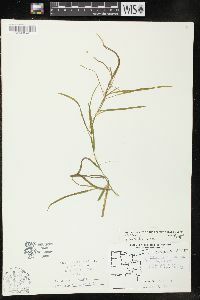 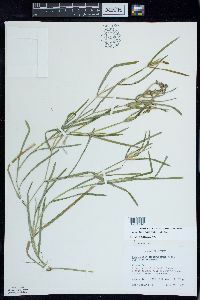 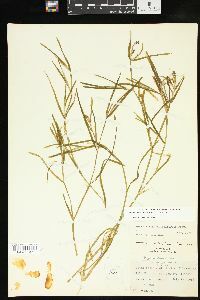 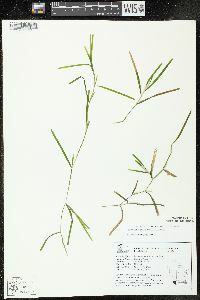 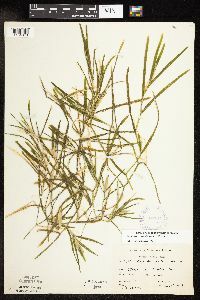 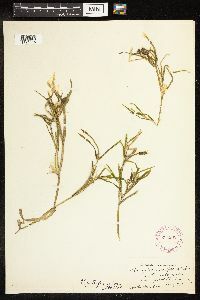 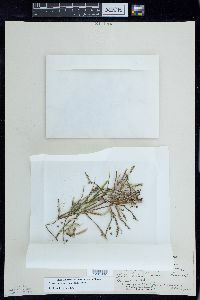 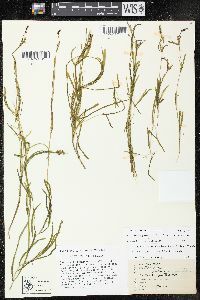 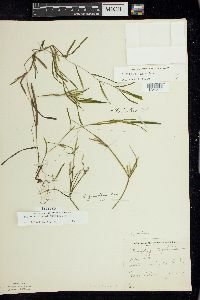 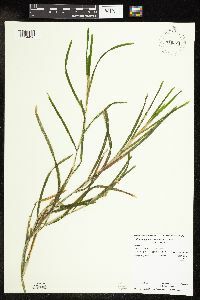 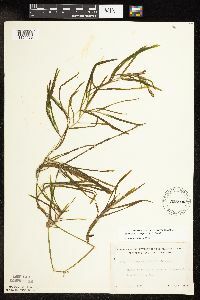 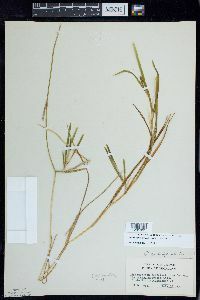 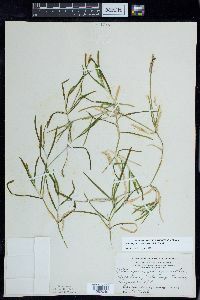 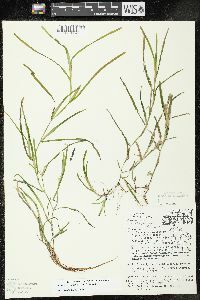 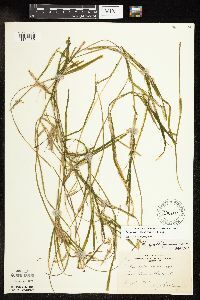 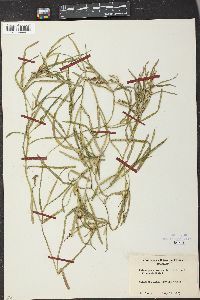 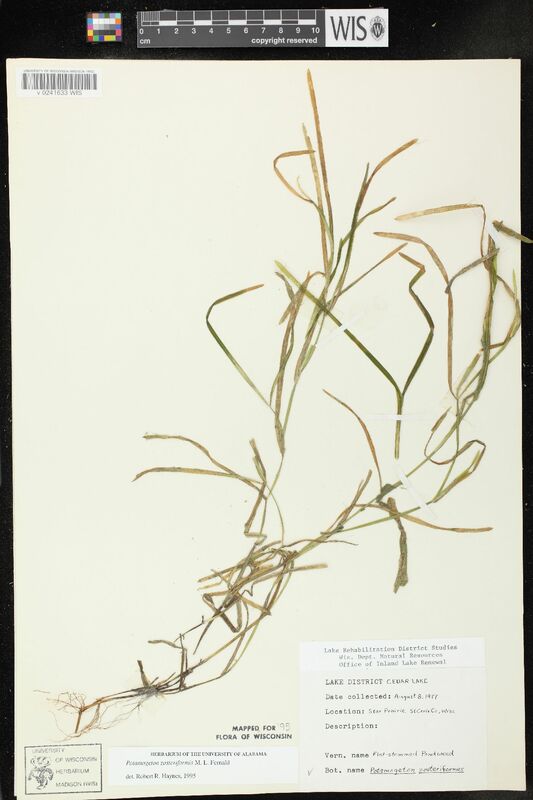 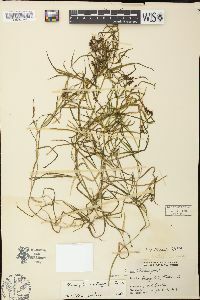 Sterile specimens of this species closely resemble sterile specimens of Heteranthera dubia from which they can be separated by the abruptly acute leaf tips. 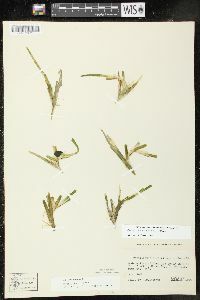 Those of Heteranthera dubia have the blades gradually tapering at the apex into a blunt tip.